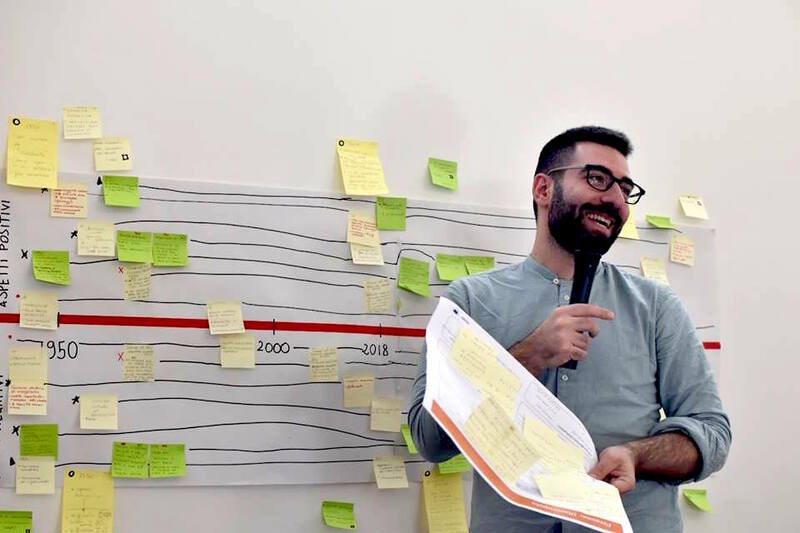 June, 2018 – As part of the IMPACT THROUGH DESIGN: UN SDGSs and Societal Challenges SDGs Applied Design Reserach Program co-produced by SocialFare | Center for Social Innovation Italy and ELISAVA – Barcelona School of Design and Engineering, Arianna Mazzeo, Director of the MasterLab in Service Design Systems of ELISAVA, interviewed Paolo Montemurro. Director of Materahub, project manager of EU funded projects, Paolo Montemurro has been working since 2010 on capacity building actions for the Creative and Cultural sector and on support to young entrepreneurs and startup in the cultural and social sector. Since 2014, he has worked on cross-fertilization between arts and other sectors of economy, society and culture. The main project tackling this topic has been Break In The Desk, a cooperation initiative among 10 European organizations to develop a methodology to foster innovation in companies and public organizations through the disruptive power of arts and creativity. Actively involved in the process of candidature and then in the management of “Matera 2019 European Capital of Culture” particularly on the capacity building process for cultural organizations that will develop the artistic and cultural program, he has been working on the topic of internationalization and networking at EU level for the Creative and Cultural sector. In this framework he is working on the project ICCI and, as technical expert, on the project CHIMERA Interreg MED where he is supporting Basilicata Region and Puglia Creative Cluster. Since 2016, he is the person in charge of bringing Materahub in European networks among which the European Creative Business Network, Creative Business Cup Network, European Creative Hubs Network. In this network, he has worked with EC Science HUB JRC on a pilot project to discover how creative hubs can become places to co-design policies to support youth employment through the Creative and Cultural sector. In 2018, he has started a new project focused on supporting faculties of arts & humanities on developing new spaces for innovation, entrepreneurship education for students and academic staff, cross-fertilization with companies. What had most impact on your life? Break In the Desk project has been the first European project I coordinated as project manager and the first one in which I tried to develop a new methodology and model to support the artistic and cultural sector by proposing a different vision of the role of the artists: innovators inside complex organizations, someone able to discover where resistance is and overcome it promoting feasible solution for all the actors involved. It has been also the very first direct interaction with the challenges of the creative and cultural sector seen from the perspective of artists and cultural operators, but even from intermediary organizations that should support them. The project has undoubtedly allowed myself and Materahub to be considered among those who are at the forefront of innovation in the discussion going on in Europe about creative economy, entrepreneurship and arts and cross-fertilization between arts and other sectors of society. It has been also an opportunity to start thinking at how to innovate the indicators of impact for arts and culture and how to make the impact, which rarely is economic, measurable from the point of view of policy makers. The project managed to involve in its life over 500 artists from 7 countries in workshops for sustainability, pilot actions, “break in” creative interventions and is now becoming a European network that will keep on promoting the value of arts in impacting society at all level. Italy saw the first dots of the network with a cooperation that connected all those organizations promoting arts and business (Materahub, Link Campus University, Sineglossa Creative Ground, Innovazione Creeativa, Fusion Art Center) and had the chance to replicate a creative intervention in Ancona, at the harbor with the port authority that asked 25 artists from Italy and the Balkans to work on solution for tourists to make them discover the city of Ancona while waiting for their ferries at the harbor. The main value of the project is in the capacity of artists to read the internal processes of complex organizations, understanding human relationships that could foster or block innovation. It is not the artistic product of the creative intervention that matters but the process through which the artist is able to guide the organization and the people working in it, discovering themselves and realizing what are the real roots of problems or the potentials for growth. The future has in store new applications of the methodology to museum, hospitals, schools trying to improve more and more the already existing methodology and tools.